Rob from the rich and give to the poor? Easy peasy. Having the right look to lead a band of merry men in Sherwood Forest? Not quite so easy. Well, until you make a stop at HalloweenCostumes.com! You see, we've got your back, and whether you're planning on taking on the Sheriff of Nottingham, or if you just want to build some sweet tree forts to hide out from the King in, we think you should have the best Robin Hood costume ever. 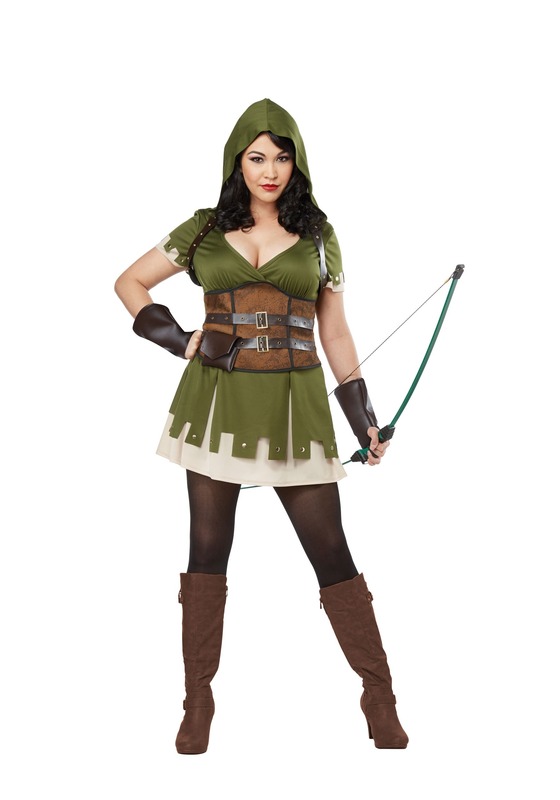 And since we're talking about a Robin Hood costume for women, we want it to be cool. Chic. And totally appropriate for medieval England! Tall task and a tall order, but we've achieved it with great results, after all, we've got this Plus Size Lady Robin Costume ready for you! Let us assure you, this costume is ready for all the fun you can handle. You can get your own merry band of folks together, and when you've got your crew, all you'll have to do is take up residence in Sherwood Forest. Or just your local costume party. That works too! This classic costume is styled as a hooded dress along with a cool belt and shoulder harness. It's totally something the real Robin Hood would have worn. Portraying this classic character a ton of Halloween fun, be it for kids, guys, and especially for women! Take the lead as Lady Robin Hood, and we're sure you'll be robbing from the rich in no time!